Now under construction downtown near St Lawrence Market, 88 Scott Condos by Concert has launched sales for its final collection of suites. Known as the Summit Series, this exclusive collection of corner units boast larger than average living areas. Like other suites at 88 Scott, the Summit Series will come standard with the finest luxury features and finishes like high quality cabinets and integrated Euro-style appliances in kitchens, wide plank laminate floors, smooth ceilings, corian countertops and roller sun shades. When it comes to amenities, 88 Scott certainly doesn’t disappoint. From a 24-hour concierge in the expansive lobby, to the fully-equipped fitness centre, yoga room and seamless edge pool, 88 Scott has everything you would need for rest and relaxation. 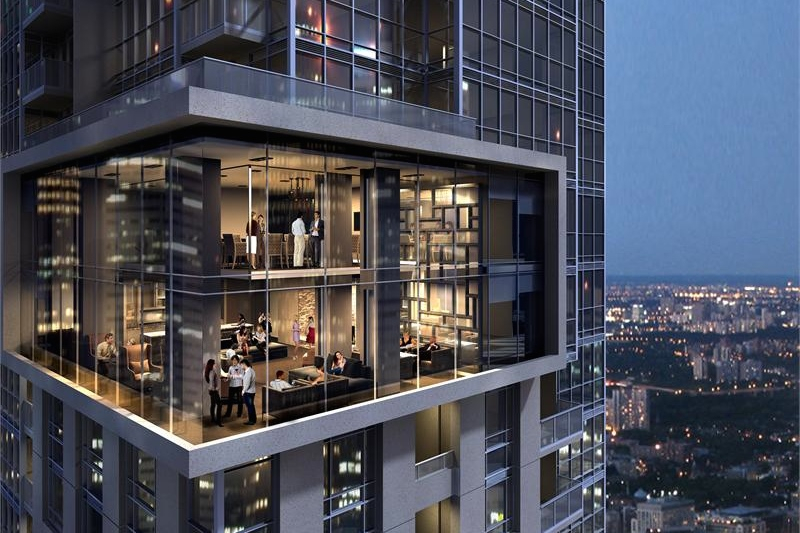 Residents will also have access to an impressive split-level Sky Lounge on the 46th and 47th floor. This spectacular lounge area offers a spacious party room, fireplace, bar, caterers’ kitchen and a private dining room with lake and city views. Situated on Scott and Wellington, the development also offers plenty of local amenities. Boasting a perfect WalkScore of 100, 88 Scott is walking distance to many shops, restaurants, cafes, and the Financial District. It’s also steps from subway and streetcar lines. With the project now over 90 per cent sold, this is your last opportunity to purchase at pre-completion prices. Remaining suites range in size from 1,016 to 2,920 sq ft, and are starting at $683,900. Parking is an extra $49,000, and lockers are $4,900. Occupancy is scheduled for October 31, 2016.